Easy-to-use software designed for facilities management and parts inventory in workshops and maintenance areas. Take control of your spare parts, purchase orders, preventative maintenance, budgets, faults and trouble calls all in one place! Keep all of your inventory and maintenance information in one place instead of spread around in multiple files and on lots of paper. Whether you're the manager, the head mechanic, or the casual technician, Parts Tracker is simple to use and makes it easy to report on your day to day operations. 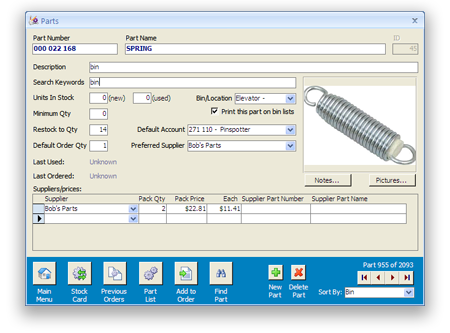 Originally designed by bowling alley pinspotter mechanics, Parts Tracker has grown to incorporate features for a wide range of industries.